Heteroscodra maculata Pocock, 1899, also known as the “Togo starburst baboon” or “Ornamental baboon”, is a very stunning and remarkable bird spider due to its coloration and patterns from West-Africa. 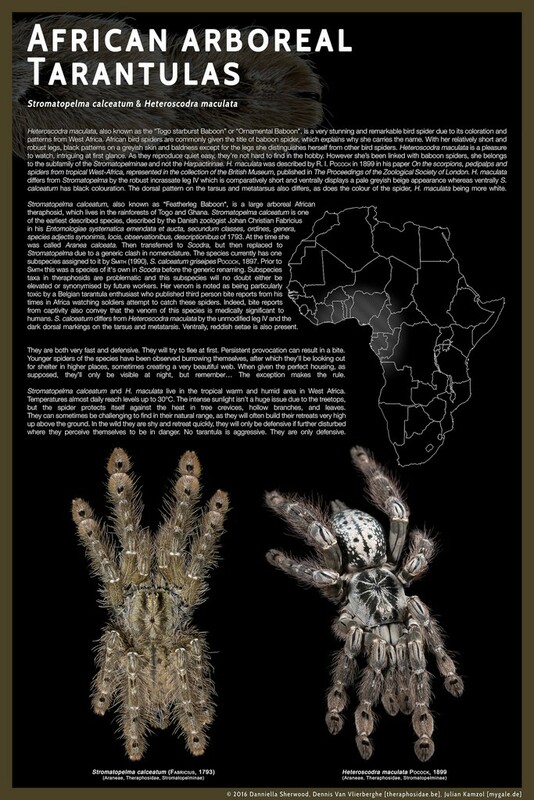 However she’s been linked with baboon spiders, she belonged to the subfamily of the Stromatopelminae for a long time (and not the Harpactirinae). African theraphosids are commonly given the title of baboon spider, which explains why she carries the name. Since March 2017 the spider belongs to the subfamily of the Aviculariinae. With her relatively short and robust legs, black patterns on a greyish skin and baldness except for the legs she distinguishes herself from other bird spiders. Heteroscodra maculata is a pleasure to watch, intriguing at first glance. As they reproduce quiet easy, they’re not hard to find in the hobby. Common names: Togo starburst baboon, Ornamental baboon. Category: Old world tarantula. Not recommended for beginning hobbyists. Venom: Probably strong. Depending the location of the bite and the amount of venom released, this might be a painful experience. However, no valuable scientific research has been done yet. Origin: West-Africa, being Benin, Ghana, Ivory Coast, Nigeria, Togo. Being told, Heteroscodra maculata has been seen in Cameroon, Chad, Congo and Gabon as well. Behavior: Very defensive. The spider will try to flee at first. Persistent provocation can result in a bite. Younger spiders of the species have been observed burrowing themselves, after which they’ll be looking out for shelter in higher places, sometimes creating a very beautiful web. When given the perfect housing, as supposed, they’ll only be visible at night, but remember… The exception makes the rule. Heteroscodra maculata lives in tropical warm and humid area. Temperatures almost daily reach levels up to 30°C. The intense sunlight isn’t a big issue due to the treetops., but the spider will protect itself against the heat in tree crevices, hollow branches and leaves. Do not overheat the terrarium. From november until march the Harmattan brings a cold-dry and dusty wind from the Sahara over the West-African subcontinent. Both temperature and humidity drop for 4-5 consecutive months. Temperature: 26-30°C (day), 22-25°C (night). Humidity: 70-80%. During 4-5 consecutive months a year this may drop to 60-70%. Adult: LxWxH: 20x20x40. Min. 3x span width in height. * Provide a piece of hollow tree trunk or corkbark. Fill it halfway with moist substrate. Smaller than adult: Minimal 0,5x span width. * During 7/8 months the spider lives in humid area. Note that cages with high humidity levels are very sensitive for mites and other parasites. Please take your precautions. Wet season: March, April, May, June, July, August, September, October. Dry season: January, February, November, December. Warmest months: January, February, March, April, November, December. Mating Heteroscodra maculata normally runs smoothly. However the spider is known to be very defensive towards any disturbance, the female in general welcomes te male “gently”. • Plan mating during dry season. Systematically raise up humidity. • As soon as you’ve noticed the female is not coming out of her burrow anymore, she’ll probably start making the cocoon. Deprive the cocoon, when desired, 6 weeks later or 5 weeks after you’ve seen her making it. Store the eggs at a humidity of 80-90% and a temperature of 25-29°C. Expect 100-150 spiderlings to come out. • A female Heteroscodra maculata will typically attach her cocoon to one of the walls of her burrow? 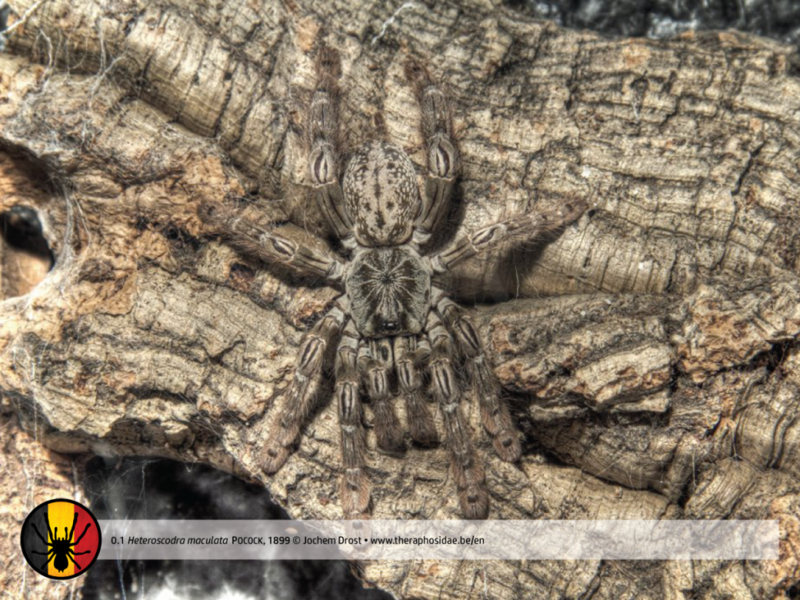 • Heteroscodra maculata shares her habitat with Stromatopelma calceatum? Click on the photo or here for another version. For more information sheets, click here. • Taxonomical revision & cladistic analysis of Avicularia Lamarck 1818 (Araneae, Theraphosidae, Aviculariinae) with description of 3 new genera.  • A new African arboreal genus and species of Theraphosid spider (Araneae, Theraphosidae, Stromatopelminae) which lacks spermathecae. The systematic position of Xenodendrophila, Stromatopelma and Heteroscodra is discussed. Can this spider been hold and picked up. Hello, my name’s Alex. I was impressed by your site presentation and all the information you provide, I have a website called westafricandocumentary.com. It shows short films and content about West Africa. It’s currently growing fast and last week it doubled in size in two days, now receiving 2,000 page views weekly. Thank you very much for your reaction and esp. for chosing my website (out of plenty) to link. Of course I’d be honored to be mentioned on the contributor page. Feel free to mail me about that (button on main page). Here are links to the “Natural World” page featuring your photos and also the “Contributors” page where you are listed. Thank you for contributing to Westafricandocumentary.com.